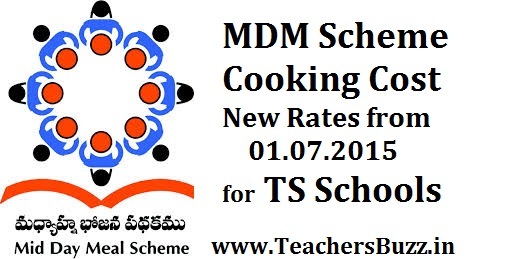 MDM Scheme Cooking Cost Revised / New Rates from 01.07.2015 for TS Schools. GO.38 MDM Scheme Cooking Cost Revised / New Rates from 01.07.2015 for TS Schools. GO.38, RC.01, MDM Programme, MDM Scheme, DSE, Telangana, MDM Scheme Cooking Cost New Rates From 01-07-2015 for TS Schools, Mid Day Meal Scheme Cooking Cost Revised Rates, National Program of Mid Day Meal Scheme for the year 2015-16, providing egg twice a week, Cooking Cost New Rates for PS, UPS and High Schools. School Education – Mid Day Meal Programme – Enhancement of cooking cost w.e.f 01.07.2015– Orders – Issued. 1.From the Director(MDM),GOI,MHRD, DSE&L, Shastri Bhavan, NewDelhi letter No.1-1/2009-Desk (MDM), dated: 28.07.2015. 2. From the DSE, T.S., Hyderabad Lr.Rc.No. 01/MDM/2014, Dt:30.07.2015, 27.08.2015 &19.09.2015. 3. After careful examination of the proposal Government hereby enhance the Cooking Cost from Rs.4.60 to Rs.4.76 for the Classes I to V and from Rs.6.38 to Rs.6.64 for Classes VI to X w.e.f. 01.07.2015 as agreed by the Government of India and Cooking Cost from Rs.6.38 to Rs.6.64 for classes IX and X. 4. This order issues with the concurrence of Finance (EBS.IV) Department vide their U.O.No. 14320/202/EBS IV/SE/2015, Dt: 14.12.2015. RC.O1 C&DSE Dt:03.09.2015 MDM Scheme Cooking Cost New Rates From 01-07-2015.